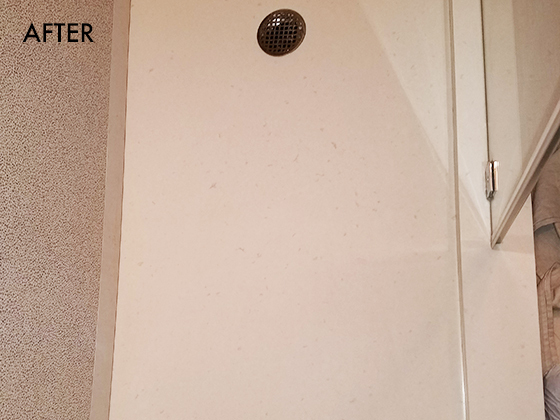 This image of the Caesarstone shower was taken when we first arrived on the job site. 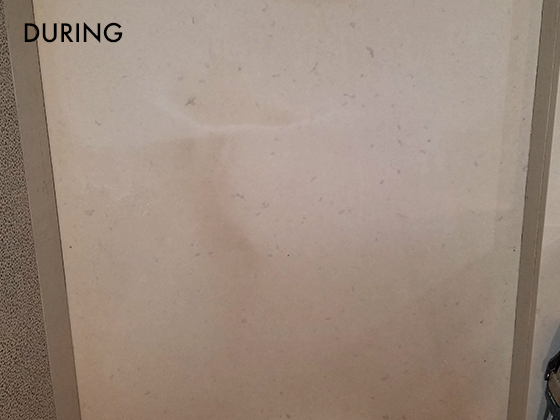 Here is another image of the discoloration on the Caesarstone. This image was taking during our Caesarstone honing process. Here is a close up image, taken during our Caesarstone restoration process. 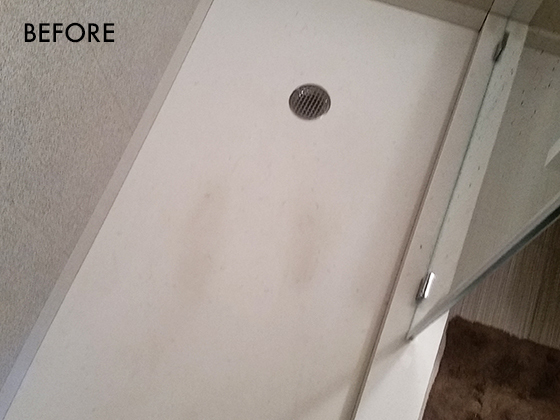 This is the Caesarstone shower after it was honed, cleaned, sealed, and restored. 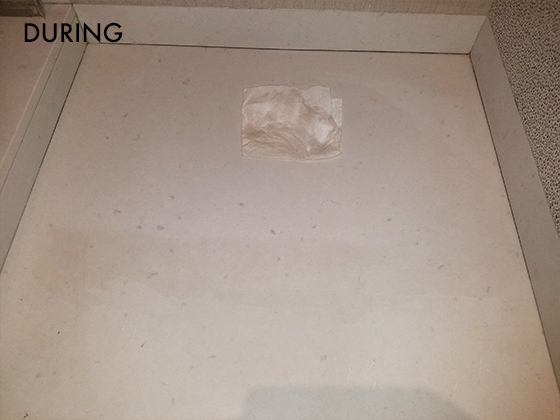 We received this call because the clients had “footprint” stains on their CaesarStone shower floor, as you can see in the BEFORE images. Their housekeeper, contractor, designer/architect, and a professional cleaning company had no success in their attempts to remove the marks. They hired a new design contractor with whom Fabra-Cleen is affiliated, and although they too were baffled, they were confident that we could remedy the situation. A detailed inspection revealed that what appeared to be footprints were actually areas with a different finish. It turned out that a year prior, the contractor who installed the shower (not us) had improperly resurfaced several areas immediately after the installation. The client had not even remembered that this occurred until we insisted that someone had definitely worked on this material. 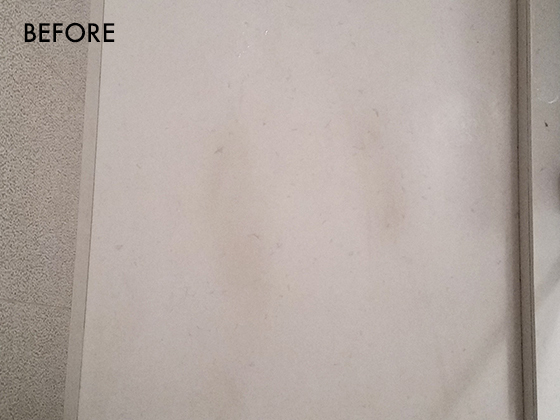 We used a hand tool to hone the discolorations, revealing the brand new surface underneath. Notice the difference in the DURING images. This process revealed that the entire floor was slightly discolored, so we honed the entire floor to achieve the nice even appearance and restore the matte finish you see in the AFTER image. As a precaution, we applied an impregnator (sealer) to the material. Caesarstone is supposed to be inherently stain resistant, but given the history of this shower floor, we weren’t taking any chances. The Manhattan client was relieved to have the problem solved, and we were happy to have helped out both the client and our business affiliate. To learn more about engineered stone and quartz restoration, visit our Engineered Stone and Quartz services page. For a free estimate or to schedule Caesarstone cleaning, polishing, and sealing services in NY, NJ, and CT, contact us online or call today. We have 3 numbers to choose from 212-777-4040 | 718-776-3564 | 516-377-0993.